Your first answer to this question may be no! You may say no because you have been married for over ____ years. 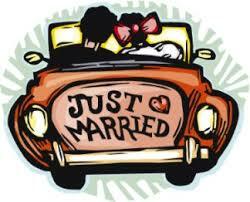 However, once you read this definition of “Just Married” you may have to answer yes to this question. After listening to a teaching by TIm Lundy with the Family LIfe Ministry, I now see the words “Just Married” in a different way. Many are married but are not operating with a “Closeness or in Oneness”. This week’s challenge is to strive for oneness. Oneness is having a closeness in your marriage. When you are not close, you are distant. You feel like you are just room mates instead of soul mates. Although you and your spouse are very different, you have to learn to bring your differences together to become one. If we are not careful, we will let life, our career, our children, technology and everything else keep us from getting closer to the one we vowed our lives to. Oneness is the goal that God established in marriage. However, oneness doesn’t automatically happen. Both parties must be intentional about growing and flowing together and not growing apart. In conclusion, we can move from being “just married” by establishing oneness. The goal is to get closer to your spouse in mind, heart and will. Open up, share your thoughts, your dreams and your mind. Discuss where you are going as a couple so that you are both going in the same direction. Keep the love flowing and be sure that you are emotionally connected. Be committed to working together. God is for your marriage and He wants you to be ONE! Denise Thompson: I’ve been married for 26 years to the same man. We are not on one accord and I don’t know if we will ever be, but I am willing to just keep on praying for change each day. He is as good as he can be for now. I pray for grouth in the both of us. Our love is stronge and we both have gone through some rough times in our lives. The both of us are trying and that is what gives me hope for tomorrow. I wish that achieving oneness could be done “once and for all” but I have found that it cannot be done. I have been married for 29 years and it seems that there is an ebb and flow that requires us to fight for oneness year after year. We have it, then we lose it….we have it….then we lose it. I really believe this is partially because we are both changing and life changes as well. My resolve is to never stop working and fighting to achieve oneness in my marriage. I am blessed to have a husband who is equally committed to this goal. Even so, it’s not easy and it is certainly not “once and for all.” Stay persistent in your pursuit of oneness!